Many of the paintings of Camille Pissarro are unquestionably Impressionistic icons. Others, however, have surprising elements uncharacteristic of the typical Impressionist model. These unexpected aspects occur more frequently in Pissarro’s late paintings, but they also appear in works completed early in his career when Impressionism was at its peak. Puzzling and out of the ordinary, they make some Pissarro paintings difficult to read with the usual Impressionist language. This visionary artist invented techniques that foreshadowed not only pointillism, his well-known diversion from Impressionism, but other techniques that would not even have a name until the mid-20th century. This comparison of a painting by Pissarro with one of Jackson Pollock reveals just how far Pissarro pushed into the future. 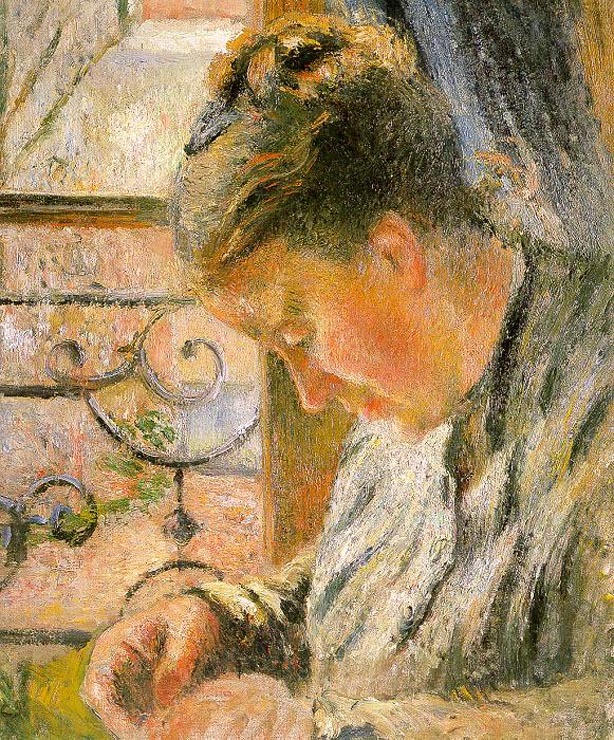 Pissarro and other Impressionists developed a new art that expressed their visual sensations. They painted modern life with bright high-keyed colors and visible brush strokes. They painted en plein air, gathering their sensations from the scene itself. In this inventive and defiant environment, Pissarro turned his back on academic painting and the Salon. Like Pissarro, Jackson Pollock began with the academic painting of his day. A student of Thomas Hart Benton, he learned the rules of representational painting. However, a new spirit was brewing in New York, one that would discard realism and retain only its essence. When abstract expressionism did not yield the latitude he required, Pollock spread his canvas on the floor, layered it with color, and dribbled it with paint. The link between Pissarro and Pollock was first observed three decades ago by the distinguished art historian Christopher Lloyd, who said, “The degree of sophistication in the variety and application of colour by Pissarro … finds a distant echo in, for example, the canvases of Jackson Pollock.” Though the careers of the two artists were separated by fifty years, a comparison of two of their paintings provides evidence that both artists were pushing the boundaries of current painting in ways that are strikingly similar. In a study of Pissarro’s La Côte des Bœufs, Pontoise and Pollock’s Enchanted Forest, the ironic resemblance in names is irrelevant in light of other more remarkable parallels. The most obvious comparison is the verticality of both paintings. The upright format of the Pissarro is in itself unusual because at that time most landscapes, both Impressionist and academic, had a horizontal format. Pollock’s painting is also vertical and even more slender relative to its height. In 1877 when Pissarro painted this canvas, most Impressionists used techniques of painting, composition, and color to draw attention to a single subject—a church, a bridge, a bank of flowers. However, this painting, like many of Pissarro’s works, has no central focal point. The artist fails to define what he means the viewer to see. The background is blocked by a hill, creating a high horizon line and allowing little room for blue sky and clouds. The houses, set on the hill at various levels, are not the focus; they are virtually hidden by a screen of tall trees, forcing the eye to work through a maze for a glimpse of their red roofs. The trees are obviously not the focal point because all the viewer sees is their middle portion. The treetops are cut off by the upper edge of the canvas. The tree roots are hidden by scrubby bushes, so bland in color that they clearly are not the focus. To the left, a small brook runs across the corner; but it is so insignificant in size, placement, and color that it often goes unnoticed. Peering out of the buses are two small faces that, if they are seen at all, challenge the viewer to wonder about their presence. Indeed, there is no clear focal point at all. The obvious conclusion is that Pissarro meant the viewer to see the overall painting—together as one unit—forcing the eye to wander without guidance in and out of the trees. In the Enchanted Forest, the thin painted swirls resemble Pissarro’s tall curvaceous tree branches and scrubby bushes. The lower layers are spread with warm earth tones from bottom to top and dotted with small thin splashes of a rusty red similar to Pissarro’s red roofs. The upper layers are a tangle of green, beige and black arches and curves, which form an effective screen for the colors below. [Colors in photos are rarely as good as in person.] As in the Pissarro, there is no focal point. The eye wanders restlessly in and out of the swirls and beneath the various layers to find the painting, which can only be seen in its totality. In 1955, Clement Greenberg gave this phenomenon the name of “all-over” painting, and abstract expressionists used the technique to banish representational painting. Eighty years earlier, Pissarro was already using all-over painting with no focal point. Even though the elements in his painting—trees, houses, hill and sky—are recognizable, the viewer sees them simply as abstract elements that dissolve into the painting’s unity. In fact, all-over painting became a feature of many of his landscapes and cityscapes. Though the Pissarro motif suggests depth, the intensity of colors push the background forward, flattening the perspective and making the view appear more shallow than one would imagine. In the Pollock painting, the impasto of the multiple layers suggests that the painting has depth. Yet the swirls and splatters contain the eye within the shallow view. Pissarro and Pollock also used color in similar ways. 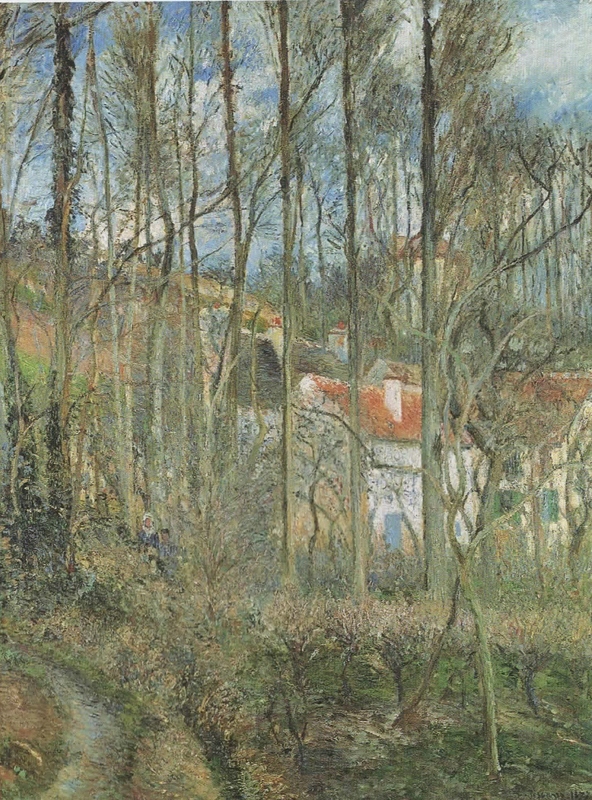 In Pissarro’s landscape, the earth tone colors are nearly the same value, low keyed to suggest the shade of the trees and perhaps late afternoon shadows. Even the blue sky is hazy, with grayish white clouds and no obvious sun. 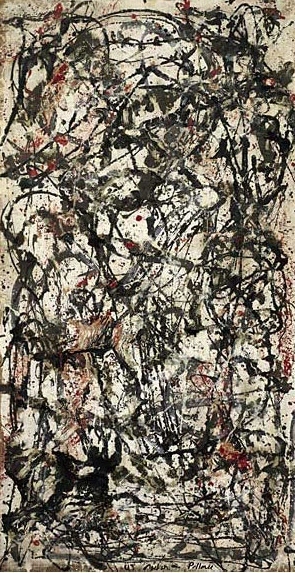 Similarly, Pollock used earth tones of close values, low-keyed and shadowy along with black. The hints of red are a muted brick. The green of the drippings is low-key, fitting into the earth tone palette. Both paintings use color and thickly applied texture to define layers. Pissarro used brushes to build thick masses of pigment on the canvas. Pollock used heavy coats of paint topped with swirls and splatters. While the two paintings are decidedly different, the effect they achieve is amazingly similar. Pissarro pushed his innovative layering and all-over painting to the limit in the 1870s, but it had no name until eight decades later when Pollock and other abstract expressionists refined the concept. * PDR – Number of painting in the Pissarro:Critical Catalogue of Paintings. Joachim Pissarro and Claire Durand-Ruel Snollaerts, 2005. Varnadoe, Kirk. Jackson Pollock. New York: The Museum of Modern Art, 1998, pp 23 and 47. Lloyd, Christopher. Pissarro. New York: Rizzoli Interntional Publications, Inc. 1981, p 110. Lloyd, Christopher. Camille Pissarro: St. Thomas to Paris. London:Stern Pissarro Gallery, 2003, p 44. Greenberg, Clement. “American-type” Painting. Partisan Review. 1955; 22:179-196. We thought we knew the Impressionist, Camille Pissarro. But the exhibition, Pissarro’s People curated by Richard Brettell, has expanded our notions about this radical artist. While the exhibition will close in less than a week, the concept and ideas it communicated are broadened in the superb exhibition catalog. The painter, better known for his lyrical and sometimes puzzling landscapes, continues to surprise anyone who thinks his works are “just pretty pictures.” Never more so than in this powerful collection of figure paintings that range from his earliest career to the end of his days. He painted friends and neighbors busy at everyday tasks in the fields and orchards or selling produce at outdoor markets in Pontoise and Gisors. All are portrayed just as they are, with honesty and respect. There is a part of Pissarro that none of us knew very well. He was an anarchist, who was disturbed by the problems he saw in capitalism. To share his beliefs with his grown nieces, Pissarro made drawings of shameful situations in the society of his time. His son Lucien bound them in a book called Turpitudes Sociales. The book has reproductions of these drawings, and now we can see what worried him. Unfortunately, many of those same things still worry us. Much more than a catalogue, the book introduces us to part of Pissarro that we did not know before. We realize what a complex person he was and begin to understand how that is reflected in his art. The book is engaging, thought-provoking, and an enjoyable read. Most often, Pissarro’s paintings receive easy categorization and hasty analysis. But this book clearly indicates that his work deserves much more—a closer look for universal truth.